Like 103 and 305, the text is addressed to the soul. 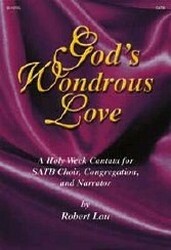 It meditates on Christ's wonder­ful love (st. 1), which brought about our salvation (st. 2), a love to which we and the "millions" respond with eternal praise (st. 3-4). will not perish but have everlasting life. to condemn the world but to save it. so as to present you holy and blameless and irreproachable before him. we are forgiven and reconciled to God. Praise be to God! comfort, encourage, and protect you. Merciful God, some of your children are joyfully singing your praise. Others are languishing in despair. and in him we have resurrection hope. and lead us all to your house, where we may feast together at your table. Amen. words in the context of the entire narrative. grant that we too may be included in that prayer. in the name of Jesus Christ, our suffering Savior. Amen. your grace in this world and in the world to come. Amen. reaching out to provide for those who suffer in our human family. Hear this our prayer for your mercy’s sake. Amen. and in the night I still must cry. Regard me, listen to my prayer. forgotten near the pit of death. Your wrath weighs heavy on me here. Your angry waves upon me break. Friends watch in horror from afar. I am shut in without escape. My eyes are dim because I weep. My hands are lifted up to you. Can graves tell out your mighty deeds? There, who can know that you can save? Lord, do not hide your face from me. You have afflicted me from youth. Your anger is destroying me. Your flood of anger closes in. shunned and forsaken, all alone. Amen. leading us to bring this same relief to others. Amen. enable us by your Holy Spirit to be faithful to our call. and endure our sufferings, even unto death. O Christ, in whose name we pray. Amen. entrust our lives into your faithful hands of love. In the name of Jesus, who gave his life for us all. Amen. Although various sources have attributed this text to a number of different writers, it remains anonymous. 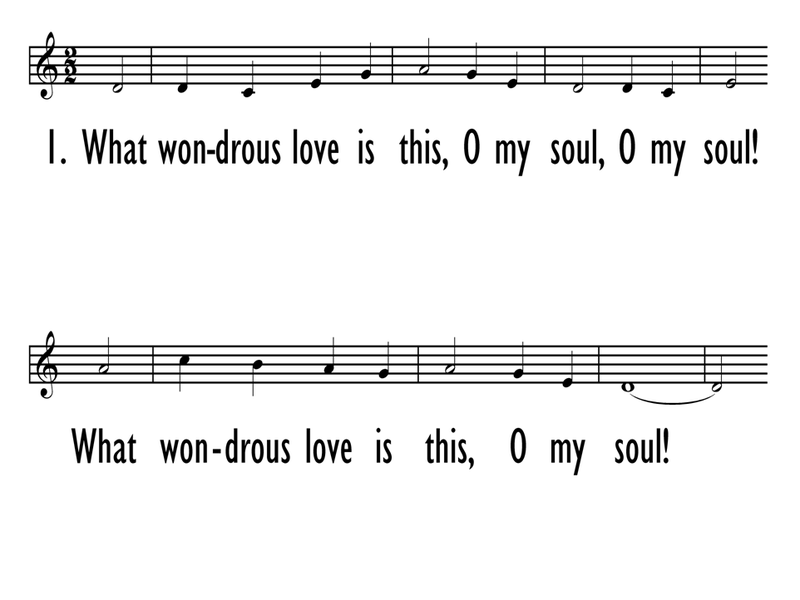 "What Wondrous Love" was first published in both Stith Mead's hymnal for Methodists, A General Selection of the Newest and Most Admired Hymns and Spiritual Songs (1811), and in Starke Dupuy's hymnal for Baptists, Hymns and Spiritual Songs (1811). The text is addressed to the soul. It meditates on Christ's wonder­ful love (st. 1), which brought about our salvation (st. 2), a love to which we and the "millions" respond with eternal praise (st. 3-4). Described by Erik Routley as "incomparably beautiful," the tune is in ABA form and in Dorian or Aeolian mode (depending on which version is used or which "authentic" performance is heard). The setting is by Emily R. Brink. 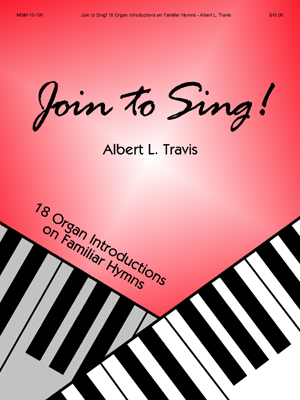 The Hymnal 1982 includes the original three-part setting with the melody in the tenor; that setting could be useful for choirs alternating with the congregation on the hymnal setting. Sing unaccompanied, or use light accompaniment for stanzas 1 and 2, gradually becoming more forceful through stanza 3, and use full organ (or piano) for stanza 4. For many years, Calvin College hosted a Tenebrae service for students and the community. I’ve had the privilege of helping to lead a number of these, but there is one service in particular that I will never forget. This was the second year that we had used the first two lines of “What Wondrous Love” as a refrain sung throughout the service after each Scripture reading. As we heard and reflected on the last hours of Christ, each time we sang this refrain it was more and more powerful. Near the very end of the service, as we sang this refrain during the “Shadow of the Crucifixion,” an older visitor from down the road slumped against his wife, having just suffered a fatal heart attack. The congregation sat in tears and prayer as campus safety administered CPR and a defibrillator, to no avail. In the midst of this reflection on Christ’s suffering for our sake, this man had gone home to be with his Savior. As I left that place, the last stanza of the hymn came to mind: “And when from death I’m free, I’ll sing and joyful be, and through eternity I’ll sing on.” Indeed, what wondrous love this is, that frees us from the fear of death, and causes us to lift our voices in wonder at the love of the Lamb.